Charmingly atrocious old-school Christmas sweaters. Deck your torso in an ugly sweater, fa la la la la, la la la la. Our Ugly Christmas Sweaters are pre-owned vintage sweaters bursting with bad taste, regrettable design, and ill-conceived uses of glitter. They're impossible to miss! 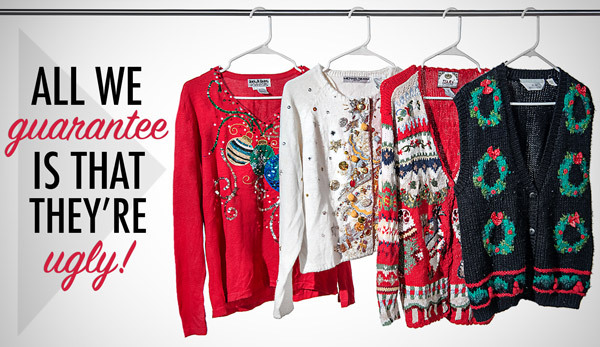 Because they are used (thoroughly cleaned, of course), we cannot guarantee the size, color, style, design, or pattern of your Ugly Christmas Sweater. However, the surprise as to what level of unsightliness has been bestowed upon you is half the fun! Sleeves: It may be a sweet vest! 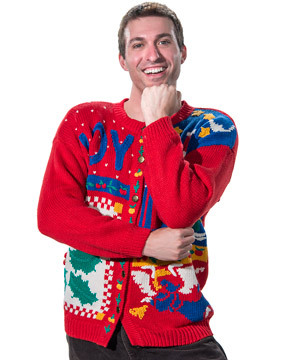 Thanks to Vat19, you'll be a shoo-in to win the ugliest sweater contest at your next holiday party. Our Ugly Christmas Sweaters aren't some cheesy attempt at designing something that possibly could have existed decades ago. No, no, no! These are true relics — 100% authentic — from a not-so-distant past. Our Ugly Christmas Sweaters were designed with love, care, and craftsmanship, and owned by someone who truly thought they looked great. Now you can benefit from their poor taste! 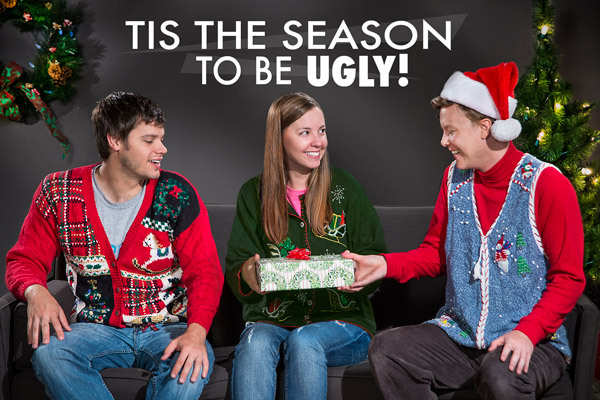 Own your next Ugly Christmas Sweater party with authentic ugliness from Vat19. You get what you get and you don't throw a fit! Ugly Christmas Sweaters are 100% vintage and 100% used (but thoroughly cleaned and sanitized). These are not newly manufactured. Therefore, you can revel in the fact that these sweaters were once the height of holiday fashion in jolly Christmases past. The pre-owned nature of this product also means that we cannot guarantee size, style, or color. While most of the sweaters are in excellent condition, some may have a missing button, a non-working zipper, or even a small hole. All we can guarantee is that they're gloriously horrendous. The bottom line is that it's a grab bag approach; when your package arrives, think of yourself as a kid on Christmas morning. A sampling of the high fashion you can expect from our Ugly Christmas Sweaters. Question: I want a red one. How do I get a red one? Answer: Sorry, but you can't. These are not newly manufactured sweaters. They are used (but thoroughly cleaned, obviously), so we have no control over what we receive. In order to maintain our low price, we cannot provide any purchasing preferences. All we can guarantee is that they'll be sufficiently horrendous. If the size is off (either comically large or super-tight), your look will definitely be enhanced. Question: But I really want a vest! Answer: Well, there's a chance you could get one, but there's also a chance you get one with a plunging neckline, glitterly puff balls, macraméd tassels, and skiing snowmen. Half the fun is the surprise of the design! Question: So I have no say in the size, color, style, or pattern? Answer: Correct! However, it will be ugly and that's what's truly important here, isn't it? Seriously, they're all gems. You will not be disappointed by their lack of aesthetic beauty. Smash that 'Add to Cart' button! First, please watch the video to the right. It explains the Burning Question feature and answers some common questions. Now, if there is something that you need to know about this product that we've omitted, please send us an anonymous question and we promise to answer it within 1 business day. Enter awesome: So we know you're not spam, type "awesome". A jolly jumbo treat made of solid peppermint candy. A holiday desk saguaro that lights up. Tiny tinsel tree powered by USB.